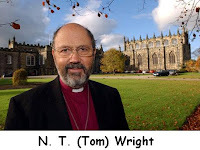 N. T. (Tom) Wright is famous (or infamous) for his view on justification, which many (myself included) take to be closer to a Catholic, synergistic view than the classic Protestant view - which we insist is the Biblical view. To simplify the debate (without, hopefully, distorting it too much): Wright says "justification" refers to the church - God accepts those who identify with Christ as the mediator of the covenant. The "Lutheran" or "traditional" response is that such a view makes our act of identification with Christ meritorious - it waters down the idea that justification is an entirely gracious act of God, springing entirely from his willed generosity. The "Lutheran" view of justification is that it is a judicial declaration which sets the sinner in a perfectly right relationship with God. God is therefore the active agent in justification; humans are merely passive recipients. Wright replies that the Holy Spirit is active in empowering the believer to trust and obey. This achieves the same result as the "Lutheran" view - God is still the active agent in justification - but, Wright contends, his view is theologically and anthropologically richer, in engaging the whole Trinity in justification, and seeing faith and obedience as a whole-person response. Both sides of course claim to be Biblical and publish books and blog posts and beat each other round the head with Bible verses (*sigh*). Phillip Long posts summaries of Schriener and Thielman. What is it about late winter - early spring?